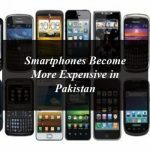 Home » Technology News and Business Updates Of Pakistan » How to Download and Install GBWhatsapp For Android and iOS Devices? Latest Version of GBWhatsapp now available for download for the Android and iOS devices. 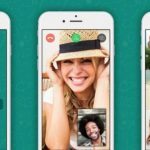 Does GBWhatsapp Safe for Use? 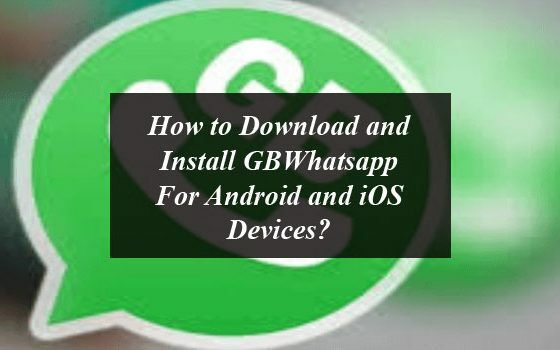 How to install GBWhatsapp for Android devices? How to install GBWhatsapp for iOS device? How to add contacts in GBWhatsApp? How to use two WhatsApp accounts with GBWhatsApp? Whatsapp is the most renowned messenging application nowadays. A number of people across the world are using the Whatsapp is order to remain connected with their friends and family. This messaging app is not only installed in the smartphones of the youngster but also the people of all ages prefer to have the Whatsapp in their mobile phone to remain in touch with their loved ones. Whatsapp is the more secure and easy to use messaging app with a number of amazing features, but still, there is something missing that the users want. There is an option of customization, everyone love to customize the downloaded apps as per their needs and choices. So if you are looking for the customization of Whatsapp and want to use it as per your’s want you are right here, Gbwhatsapp is the most reliable solution of your problem. Gbwhatsapp which was earlier available for the Android users is now also available for the iOS users so they can also customize the Whatsapp features as per their choice. It offers more amazing and unique features which you wish to have in whatsapp. You can use this app same as you are using the Whatsapp without worrying about the security and privacy of your content. This app offers the same privacy of your content as you are already enjoying using the Whatsapp. By using the Gbwhatsapp you will feel it superior to the Whatsapp in features, which are not present in this messaging app. So readers if you are interested in Gbwhatsapp here is everything for you. GBWhatsApp is a WhatsApp MOD that can be used to add new functions to this well-renowned messaging application. It is actually the modified version of the original app (whatsapp) but it has not been developed by the original developers and neither has it acknowledged as authorized to use its source code. It is said that this Gbwhatsapp offers the amazing new features that are not present in the Whatsapp and the users can feel the same as they are securely using the messaging app. Gbwhatsapp has a bunch of advance features that are not present in the latest version of messaging app. It offers novel options to govern the privacy, comprising the probability to hide status or the dual blue check without abandoning the options to observe exactly that info about the contacts. It provides the option to change the user interface and modify it changing the type and size of the font, in addition to its color. Furthermore you don’t need to use the two SIM cards, you can use the use two phone numbers at the same time in the same application. It also offering a number of functions to share documents and multimedia files. Its use is very easy just like the official WhatsApp messenger. It is based on the original application and has all the function and features that a user required. It also offers the notification about a person’s online status when you open it. It let you enjoy the status text extended to 255 characters instead of 139 limit. In this app you can send more than 90 images instead of 10. You can also send videos above 16GB. You can add up to 600 people in the recording. Let’s user to change tick styles and colors. It broadcast media without downloading to your device. In this app you can also hide the date, time, and contact name while copying a note. It lets you check the last seen of your ccontacts from the main screen. Its saves the contact’s status on WhatsApp. But this is not an add-on that encompasses its features but an individual application. That’s why you can’t install GbwhatsApp on your mobile phone if you have at present got WhatsApp as the operating system perceives it as a replica app. WhatsApp Plus or YOWhatsApp are also the other MODs that offer the new features and functions. Just like the other replica apps including WhatsApp Plus and YOWhatsApp, the Gbwhatsapp is not legal as these MODs are used to modify the features of the well-renowned messaging app. Gbwhatsapp is also not legal as the original developers of WhatsApp has not allowed the source code to the third party to develop apps using its original app. If talking about an intellectual property violation these MODs apps working like non-profit making application. In fact, for pretty a long time WhatsApp used to bar the users from its servers that resorted to these types of MODs. However, they are now implementing the anti-banning systems and the official app appears to be taking things easier, perhaps due to its irrefutable leading position within the instant messaging world. That is why you can’t find these type of MODs application at the Google Play Store and Apple App store, as it goes against the rules of this store concerning creators when it comes to allocate their formations. These WhatsApp MODs have become very famous among the users as they are offering the a number of functions to share documents and multimedia files, option to change the user interface, changing the type and size of the font and color, users also use two phone numbers at the same time in the same application without the requirement of two SIM cards. 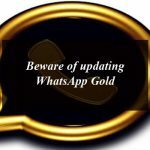 The use of the Gbwhatsapp is safe if we talk about the safety point in two ways, first is the privacy of the user from the liable malware and hackers and secondly safe in terms of protecting the user account on WhatsApp, although users have to be careful about some issues that are mentioned below. Earlier the Whatsapp authorities, now owned by Facebook, have started banning the users of the MODs from its service as a punishment because they started using the modified versions to alter the features of the original app. With the passage of time it seems that the company has starting to show the leniency and since then no one has heard about the authority has banned anyone from the service. Though we can say that the GBWhatsApp and the rest of MODs have applied diverse security systems to kick out of their users. On the other hand if we talk about the malware infections and security risks if you start using the Gbwhatsapp, as mentioned above it’s not developed by the original developers and may have security risks, but till yet we have not heard of any cases to be worried about. When you install the Gbwhatsapp in your mobile phone it got full access to your contact list and your communications, whether via text message or voice message. On the whole it can be said that by using the application developed by original developers or third parties and also including MODs you have to be aware of what you are using and that any app can put your privacy at risk. So, if you are finding how to download and install Gbwhatsapp for android and ios devices, below is the complete process by which you can simply download and install the Gbwhatsapp in your devices and can enjoy the most advance features. How To Download and Install Gbwhatsapp For Android? First of download the Gbwhatsapp Apk File by clicking on here. Once the Gbwhatsapp Apk File downloaded successfully you need to find it in the download folder of you mobile phone. After finding it click on the downloaded file, it will ask for the permission. For this you need to allow the unknown sources in your smartphones in the setting. Now, go back to the download folder and install the downloaded apk file. The whole process of installation will take only few seconds. After the installation you will see the icon of Gbwhatsapp in your menu. You need to make the GBwhatsapp account same like you do for the Whatsapp. 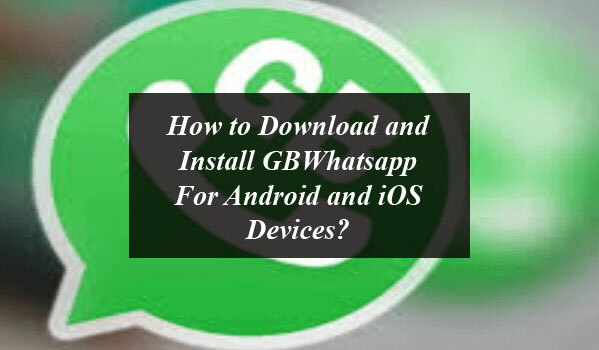 It is how you can download and install the Gbwhatsapp in your Android device and can use it just like the Whatsapp but with the most advance features. How To Download and Install Gbwhatsapp For iOS? There is no way to download and Install GBWhatsApp on iPhones and iOS devices. Therefore this has not been published in the Apple App Store as they do pretty check the Quality of every App. Therefore this kind of Application has not been published as it is against the Policies of Apple App Store. So, now, there are two ways to get GBWhatsApp on your iOS devices. Both of them need Jailbreaking your iPhone or other iOS devices. Before performing anything on your device, make a Backup of everything on your Phone. Once the Gbwhatsapp Apk File downloaded successfully you need to install it. The whole process of installation will take only few seconds and it will start immediately. So readers it’s just a piece of information gathered from the Google regarding the Gbwhatsapp for iOS device. There is no official way to download the Gbwhatsapp for iOS device. It can be risky, so the choice is completely yours. Open the app and go to the Chats tab. Click on the upper right hand side of the border on the icon that appears to be a rectangular dialogue bubble just as if you are going to begin a chat. Here you are requested to select a contact from your list to start a chat. There are other selections at the top of the interface. If you want to add a new contact fill in the form with the information about the contact and press the blue check in the top right corner to confirm the new contact. Now that contact is part of your phone’s contact list to start a new conversation. You can use the two WhatsApp accounts on the same smartphone with GBWhatsApp easily. After installing the GBWhatsApp in your phone register just like the WhatsApp and start. But must keep in mind that the phone number must be active because you will receive the activation code by SMS which you need to add in GBWhatsApp when demanded. GBWhatsApp is one of the best MODs that lets you enjoy the interesting functions and also allows the users to control privacy or over the customization of the application’s interface. The uninstallation of the GBWhatsApp is easy and just like the other Android applications. First of all you need to backup all your conversation and other data, for this you need to go the application’s Settings menu and create the backup from the option. You can recover the data in this way when you re-install the WhatsApp Messenger or other MODs. Now go to settings and then the applications manager. Search for the GBWhatsApp application and click on its icon. The next menu offers you the option to uninstall the app. Wait for a while then you will see that the application is no more working in you mobile phone. On the whole it can be said that the MODs including the Gbwhatsapp, WhatsApp Plus and others are not developed by the original developers. These mod version of the applications are even better than the official ones because they allow you to enjoy the amazing features and others icons that are not present in the original messaging app. How to Download and Install GBWhatsapp For Android and iOS Devices? Latest Version of GBWhatsapp now available for download for the Android and iOS devices.